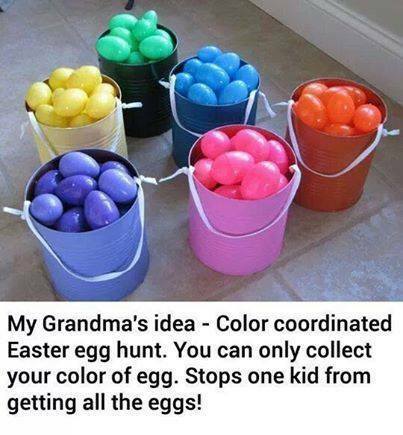 This is a great idea – allows each child to collect eggs of their color to make sure candy is divided up evenly. You could do this and have age groups find certain colors as well – this would ensure children of only certain age groups would get certain types of candy. This entry was posted in Crafts ~ DIY ~ Projects, ~Easter and tagged age, child, children, Color, colors, coordinated, easter, egg, eggs, fun, hunt, idea, kid, plastic. Bookmark the permalink.